Never did such a thing,until her girls were forcibly-separated,as media report,suffer grave injuries,for eight years. Read more of her publicized-suit,as the family just won(out of state court)significant adjudicating by our U.S.District,astute federal court. The best feeling is to learn when walkin'out of the front door of the United States District (Federal)un-bias court and learning that"Your suit is able to move forward. "Who would of thought?" 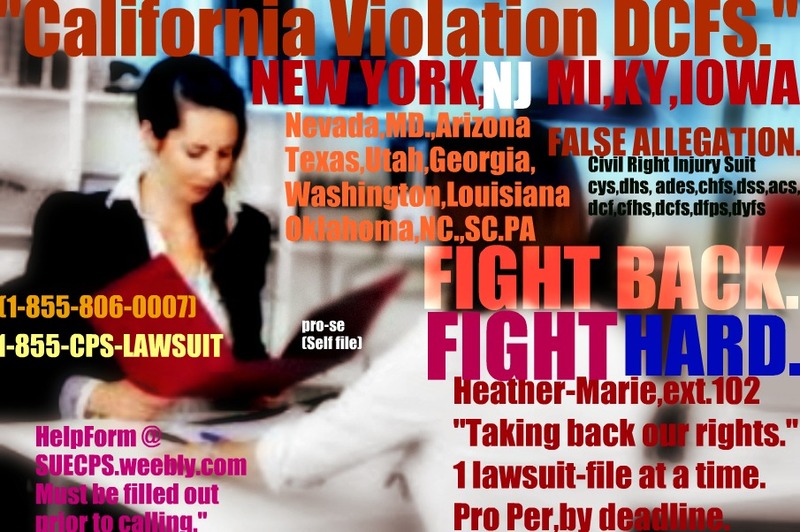 From Washington,to Indiana,Oregon,to Maryland,W.VA.,to NJ, to Pennsylvania,California,Arizona,case law wholly support so many have sued,and won such right to see their suit(s)when file timely,properly et.al,by deadline,without or with lawyer,have at least had their claim(s)fairly considered for damages when CPS has ignored the U.S.Constitution for far too long,and you should be proud of yourself,by at least"trying everyone,when you are injured ,violated cruelly by child protection services." Best Feeling is when a lawyer adage,"you can't sue child protection worker"etc. you are learning,"YOU CAN,and timely filed to hold workers accountable over at DHS. When a lawyer has lied to you,clearly misleading you,everyone? (and DON'T look back...Keep Movin'on, don't slow down,DO NOT! become sidetracked, stay FOCUS! & moreover, keep your faith in tact,and remember your able to sue DYFS,DCPP,DCFS,DHS, by DEADLINE as a self file pro-se litigant)-exactly what happened,as MEDIA validate for 1 of our staff/team leader/founder/owner at the nation's ONLY verified student expertise ctr.against DYFS,CPS of its kind...Supported by a few Good lawyer(s)for years,for which her future working in law is not in any way unclear. The best feeling is to learn when walkin'out of the front door of the United States District (Federal)un-bias court and learning that"Your suit is able to move forward!" She structure her lawsuit to perfection;while being a PRO-PER SELF FILE LITIGANT,without a lawyer." Be sure to file hence timely everyone. Fill out HELP FORM FIRST,prior to calling our busy well-recogize,respected law student consulting educational pro-se expertise ctr. No more of allowing DHS in Michigan,NJ to CALIFORNIA DCFS,KENTUCKY CHFS,NC DSS VA nationwide CPS to violate and be able to get away with such severe harm.